It was the best thing to start my "ber" months, indeed. With new office mates whose dedication to work is unquestionable and volunteers whose love for mankind is way beyond their strength, last September 1, I had an opportunity to finally get involved with something that is just perfect to melt my heart away as Christmas Season approaches, the Habitat for Humanity Philippines reach out program in Noveleta, Cavite. Cavite, the province that is badly hit by Typhoon Maring and Southwest Monsoon Rain, was our destination last Sunday. With cleaning kits already delivered at Noveleta's Municipal Hall, the moment we arrived there, a quick briefing took place and then we were all dispersed to do the things we need to accomplish that day. Since the cleaning materials need to be collated for proper distribution among the residents of Noveleta, Cavite, the team helped one another in repacking all the items for the cleaning kit and making sure that every kits has the needed cleaning items. Each cleanup kit consists of pail, water dipper, hand brush, push brush, mop, broomstick, rubber gloves, detergent powder, anti-bacterial detergent soap, detergent bar, alcohol, shovel, rake, among others. At first, I honestly thought that it would be easy, but with a target of 700 cleaning kits to collate just before the distribution starts, it gets harder and harder, specially with the sun shining like it was summer time again. Good thing, we were joined by some good blogging-friends who shared some funny stories while we are doing our tasks. The distribution was joined by Noveleta Mayor Engr. Enrico M. Alvarez and Habitat for Humanity Philippines NCR and Southern Luzon Operations Head Rommel Corro who were so glad that this pushed through and would still be able to help them. By around 9 in the morning, the distribution started. It took us about 3 hours to finish giving all of the cleaning kits, and since it was already lunch time and everyone is tired, the whole team decided to have lunch first before heading to our next activity. After an hour, the whole team, guided by the local DSWD headed to General L. San Miguel Elementary School to help some of the students, parent and teacher there who are cleaning their mud-filled background. It was a good thing that we are really prepared for this, so in no time, helping one another, the group finishes removing the mud and some flood water stocked at the backyard of the school. The people that we got to interact there were really glad that we came by. There's always something about helping other that melts anyone's heart, and I'm glad that I was there to feel it and capture it. It was indeed a great way to start my Christmas season - something that I will cherish forever. First day of "ber" months, first day of September, first Sunday of the month and first volunteer www.twitter.com/habitatphilsgig with Habitat, I guess I just received the positive vibes I need to keep me happy and positive towards the end of 2013! There are still a number of communities in Cavite that need help, so if you wanna send in some help through Habitat for Humanity Philippines, you can do so by donating through our BPI Checking Account 2421-0014-24, which is readily accepting donations. Kindly address your check payable to Habitat for Humanity Philippines Foundation, Inc.
For more inquiries you can visit Habitat for Humanity Philippines' website www.habitat.org.ph. Follow us on Facebook at www.facebook.com/habitatphilippines, on Twitter at (@habitatphils) and on Instagram at @habitatphils. 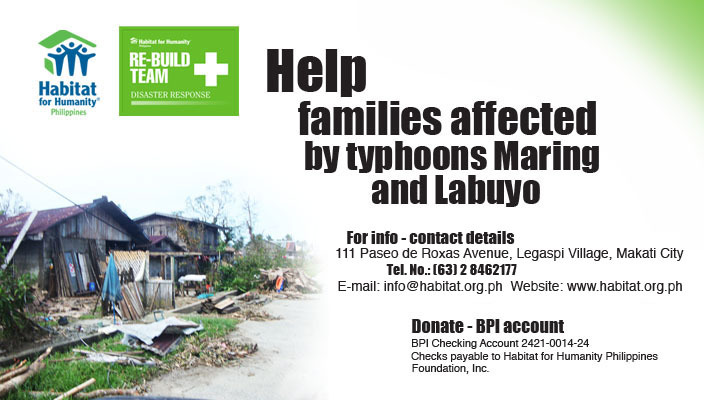 You can also call Habitat for Humanity Philippines at (632) 8462177 or email us at info@habitat.org.ph. Thank you! Thank you and keep up the good work, Habitat for Humanity Philippines!